Mrs. Santos is a retired school teacher who has been experiencing dyspnea for the past few weeks, along with cough. At night, she has difficulty of sleeping at night because of shortness of breath. When she visited her physician, she was diagnosed with heart failure stage 2. Heart failure, also known as congestive heart failure, is recognized as a clinical syndrome characterized by signs and symptoms of fluid overload or of inadequate tissue perfusion. Heart failure is the inability of the heart to pump sufficient blood to meet the needs of the tissues for oxygen and nutrients. 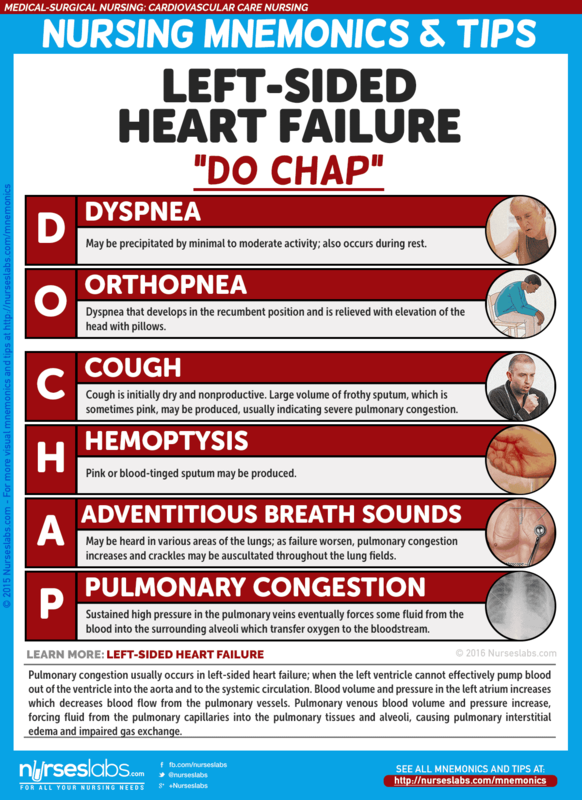 The term heart failure indicates myocardial disease in which there is a problem with contraction of the heart (systolic dysfunction) or filling of the heart (diastolic dysfunction) that may or may not cause pulmonary or systemic congestion. Heart failure is most often a progressive, life-long condition that is managed with lifestyle changes and medications to prevent episodes of acute decompensated heart failure. Heart failure is classified into two types: left-sided heart failure and right-sided heart failure. Left-sided heart failure or left ventricular failure have different manifestations with right-sided heart failure. Pulmonary congestion occurs when the left ventricle cannot effectively pump blood out of the ventricle into the aorta and the systemic circulation. Pulmonary venous blood volume and pressure increase, forcing fluid from the pulmonary capillaries into the pulmonary tissues and alveoli, causing pulmonary interstitial edema and impaired gas exchange. When the right ventricle fails, congestion in the peripheral tissues and the viscera predominates. The right side of the heart cannot eject blood and cannot accommodate all the blood that normally returns to it from the venous circulation. Increased venous pressure leads to JVD and increased capillary hydrostatic pressure throughout the venous system. 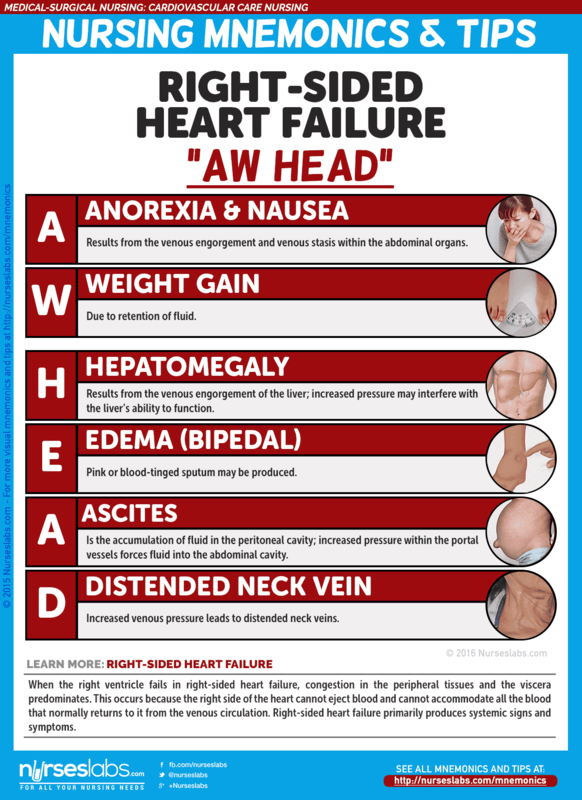 The American College of Cardiology and American Heart Association have classifications of heart failure. Stage A. Patients at high risk for developing left ventricular dysfunction but without structural heart disease or symptoms of heart failure. Stage B. Patients with left ventricular dysfunction or structural heart disease that has not developed symptoms of heart failure. Stage C. Patients with left ventricular dysfunction or structural heart disease with current or prior symptoms of heart failure. Stage D. Patients with refractory end-stage heart failure requiring specialized interventions. Heart failure results from a variety of cardiovascular conditions, including chronic hypertension, coronary artery disease, and valvular disease. As HF develops, the body activates neurohormonal compensatory mechanisms. Systolic HF results in decreased blood volume being ejected from the ventricle. The sympathetic nervous system is then stimulated to release epinephrine and norepinephrine. Decrease in renal perfusion causes renin release, and then promotes the formation of angiotensin I.
Angiotensin I is converted to angiotensin II by ACE which constricts the blood vessels and stimulates aldosterone release that causes sodium and fluid retention. There is a reduction in the contractility of the muscle fibers of the heart as the workload increases. Compensation. The heart compensates for the increased workload by increasing the thickness of the heart muscle. Just like coronary artery disease, the incidence of HF increases with age. More than 5 million people in the United States have HF. There are 550, 000 cases of HF diagnosed each year according to the American Heart Association. HF is most common among people older than 75 years of age. HF is now considered epidemic in the United States. HF is the most common reason for hospitalization of people older than 65 years of age. It is also the second most common reason for visits to the physician’s office. The estimated economic burden caused by HF is more than $33 billion annually in direct and indirect costs and is still expected to increase. Heart failure can affect both women and men, although the mortality is higher among women. There are also racial differences; at all ages death rates are higher in African American than in non-Hispanic whites. Heart failure is primarily a disease of older adults, affecting 6% to 10% of those older than 65. It is also the leading cause of hospitalization in older people. Systemic diseases are usually one of the most common causes of heart failure. Coronary artery disease. Atherosclerosis of the coronary arteries is the primary cause of HF, and coronary artery disease is found in more than 60% of the patients with HF. Ischemia. Ischemia deprives heart cells of oxygen and leads to acidosis from the accumulation of lactic acid. Cardiomyopathy. HF due to cardiomyopathy is usually chronic and progressive. Systemic or pulmonary hypertension. Increase in afterload results from hypertension, which increases the workload of the heart and leads to hypertrophy of myocardial muscle fibers. Valvular heart disease. Blood has increasing difficulty moving forward, increasing pressure within the heart and increasing cardiac workload. The clinical manifestations produced y the different types of HF are similar and therefore do not assist in differentiating the types of HF. The signs and symptoms can be related to the ventricle affected. Dyspnea or shortness of breath may be precipitated by minimal to moderate activity. Cough. The cough associated with left ventricular failure is initially dry and nonproductive. Pulmonary crackles. Bibasilar crackles are detected earlier and as it worsens, crackles can be auscultated across all lung fields. Low oxygen saturation levels. Oxygen saturation may decrease because of increased pulmonary pressures. Enlargement of the liver result from venous engorgement of the liver. Accumulation of fluid in the peritoneal cavity may increase pressure on the stomach and intestines and cause gastrointestinal distress. Loss of appetite results from venous engorgement and venous stasis within the abdominal organs. Prevention of heart failure mainly lies in lifestyle management. Healthy diet. Avoiding intake of fatty and salty foods greatly improves the cardiovascular health of an individual. Engaging in cardiovascular exercises thrice a week could keep the cardiovascular system up and running smoothly. Smoking cessation. Nicotine causes vasoconstriction that increases the pressure along the vessels. Many potential problems associated with HF therapy relate to the use of diuretics. Hypokalemia. Excessive and repeated dieresis can lead to hypokalemia. Hyperkalemia. Hyperkalemia may occur with the use of ACE inhibitors, ARBs, or spironolactone. Prolonged diuretic therapy might lead to hyponatremia and result in disorientation, fatigue, apprehension, weakness, and muscle cramps. Dehydration and hypotension. Volume depletion from excessive fluid loss may lead to dehydration and hypotension. HF may go undetected until the patient presents with signs and symptoms of pulmonary and peripheral edema. Sonograms (echocardiography, Doppler and transesophageal echocardiography): May reveal enlarged chamber dimensions, alterations in valvular function/structure, the degrees of ventricular dilation and dysfunction. Exercise or pharmacological stress myocardial perfusion (e.g., Persantine or Thallium scan):Determines presence of myocardial ischemia and wall motion abnormalities. Cardiac catheterization: Abnormal pressures are indicative and help differentiate right- versus left-sided heart failure, as well as valve stenosis or insufficiency. Also assesses patency of coronary arteries. Contrast injected into the ventricles reveals abnormal size and ejection fraction/altered contractility. Transvenous endomyocardial biopsy may be useful in some patients to determine the underlying disorder, such as myocarditis or amyloidosis. The overall goals of management of HF are to relieve patient symptoms, to improve functional status and quality of life, and to extend survival. from Cardiovascular Care Nursing Mnemonics. ACE Inhibitors. ACE inhibitors slow the progression of HF, improve exercise tolerance, decrease the number of hospitalizations for HF, and promote vasodilation and diuresis by decreasing afterload and preload. Angiotensin II Receptor Blockers. ARBs block the conversion of angiotensin I at the angiotensin II receptor and cause decreased blood pressure, decreased systemic vascular resistance, and improved cardiac output. Beta Blockers. Beta blockers reduce the adverse effects from the constant stimulation of the sympathetic nervous system. Diuretics. Diuretics are prescribed to remove excess extracellular fluid by increasing the rate of urine produced in patients with signs and symptoms of fluid overload. 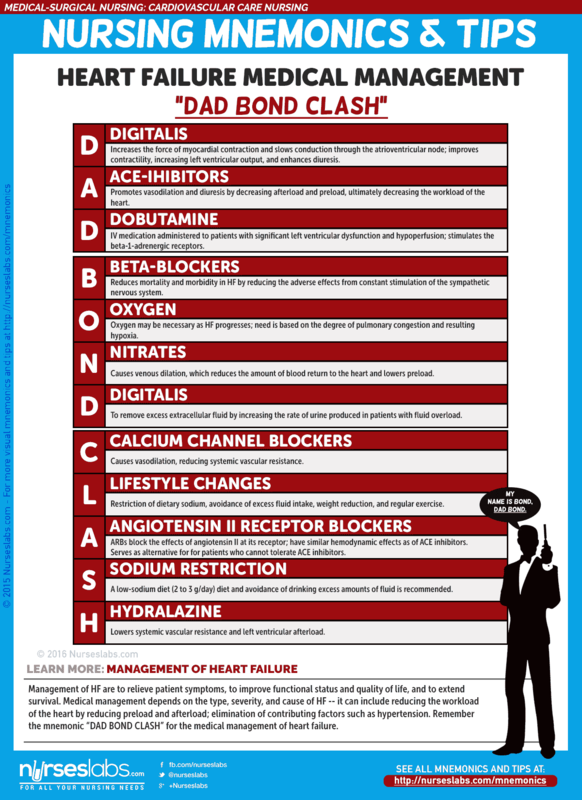 Calcium Channel Blockers. CCBs cause vasodilation, reducing systemic vascular resistance but contraindicated in patients with systolic HF. Sodium restriction. A low sodium diet of 2 to 3g/day reduces fluid retention and the symptoms of peripheral and pulmonary congestion, and decrease the amount of circulating blood volume, which decreases myocardial work. Patient compliance. Patient compliance is important because dietary indiscretions may result in severe exacerbations of HF requiring hospitalizations. Supplemental Oxygen. The need for supplemental oxygen is based on the degree of pulmonary congestion and resulting hypoxia. Cardiac Resynchronization Therapy. CRT involves the use of a biventricular pacemaker to treat electrical conduction defects. Ultrafiltration. Ultrafiltration is an alternative intervention for patients with severe fluid overload. Cardiac Transplant. For some patients with end-stage heart failure, cardiac transplant is the only option for long term survival. Despite advances in the treatment of HF, morbidity and mortality remains high. Nurses have a major impact on outcomes for patients with HF. The nursing assessment for the patient with HF focuses on observing for the effectiveness of therapy and for the patient’s ability to understand and implement self-management strategies. Assess the signs and symptoms such as dyspnea, shortness of breath, fatigue, and edema. Assess for sleep disturbances, especially sleep suddenly interrupted by shortness of breath. 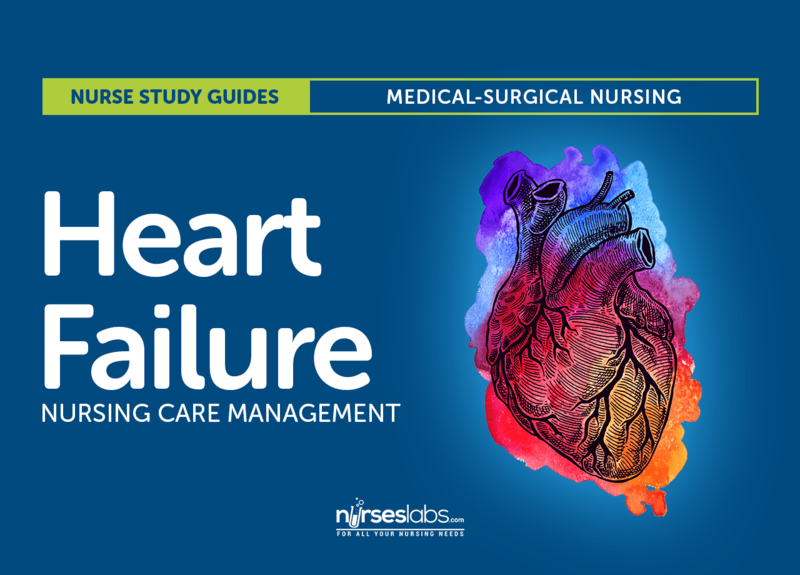 Explore the patient’s understanding of HF, self management strategies, and the ability and willingness to adhere to those strategies. Auscultate the lungs for presence of crackles and wheezes. Auscultate the heart for the presence of an S3 heart sound. Assess JVD for presence of distention. Evaluate the sensorium and level of consciousness. Assess the dependent parts of the patient’s body for perfusion and edema. Assess the liver for hepatojugular reflux. Measure the urinary output carefully to establish a baseline against which to assess the effectiveness of diuretic therapy. Weigh the patient daily in the hospital or at home. Activity intolerance related to decrease CO. Excess fluid volume related to the HF syndrome. Anxiety related to breathlessness from inadequate oxygenation. Powerlessness related to chronic illness and hospitalizations. Ineffective therapeutic regimen management related to lack of knowledge. Increasing the patient’s ability to manage anxiety. Encouraging the patient to verbalize his or her ability to make decisions and influence outcome. Teaching the patient about self-care program. Nursing interventions for a patient with HF focuses on management of the patient’s activities and fluid intake. Promoting activity tolerance. A total of 30 minutes of physical activity every day should be encouraged, and the nurse and the physician should collaborate to develop a schedule that promotes pacing and prioritization of activities. Managing fluid volume. The patient’s fluid status should be monitored closely, auscultating the lungs, monitoring daily body weight, and assisting the patient to adhere to a low sodium diet. Controlling anxiety. When the patient exhibits anxiety, the nurse should promote physical comfort and provide psychological support, and begin teaching ways to control anxiety and avoid anxiety-provoking situations. Minimizing powerlessness. Encourage the patient to verbalize their concerns and provide the patient with decision-making opportunities. Provide information about disease/prognosis, therapy needs, and prevention of recurrences. Demonstration of tolerance for increased activity. Decides soundly regarding care and treatment. The nurse should provide education and involve the patient in the therapeutic regimen. Patient education. Teach the patient and their families about medication management, low-sodium diets, activity and exercise recommendations, smoking cessation, and learning to recognize the signs and symptoms of worsening HF. Encourage the patient and their families to ask questions so that information can be clarified and understanding enhanced. Cardiac output adequate for individual needs. Optimum level of activity/functioning attained. Results of laboratory tests and diagnostic studies. Let’s test what you’ve learned from this study guide with this 5-item quiz for heart failure. B: Heart failure is the most frequent cause of hospitalization for people older than 75 years old. A: Angina pectoris also occurs among people more than 75 years of age but it is not the most frequent cause of hospitalization. C: Hypertension also occurs among people more than 75 years of age but it is not the most frequent cause of hospitalization. D: Pulmonary edema also occurs among people more than 75 years of age but it is not the most frequent cause of hospitalization. B: Coronary atherosclerosis is the primary cause of heart failure. A: Arterial hypertension is not the primary cause of heart failure. C: Myocardial dysfunction is not a cause of heart failure. D: Valvular dysfunction is not the primary cause of heart failure. C: Inadequate tissue perfusion is the dominant function as low oxygenation occurs because of this. A: Ascites may occur in cardiac failure but is not considered as a dominant function. B: Hepatomegaly is present in heart failure but not a dominant function. D: Nocturia is not present in heart failure. A: Stage I refer to a patient who reports no symptoms of heart failure at rest but becomes symptomatic with increased physical activity. B: Stage II refers to a patient who reports presence of symptoms with increased physical activities. C: Stage III refers to a patient who reports presence of symptoms with minimal physical activity. D: Stage IV refers to a patient who reports presence of symptoms even during at rest. B: An echocardiogram is usually performed to confirm the diagnosis of HF, and identify the underlying cause. A: Chest x-ray findings are also basis of the diagnosis of HF, but it is not the confirmatory diagnostic test. C: ECG is obtained to assist in the diagnosis. D: Ventriculogram is not a part of the diagnostic tests for HF. B: Heart failure is the most frequent cause of hospitalization for people older than 75 years old. A: Angina pectoris also occurs among people more than 75 years of age but it is not the most frequent cause of hospitalization. C: Hypertension also occurs among people more than 75 years of age but it is not the most frequent cause of hospitalization. D: Pulmonary edema also occurs among people more than 75 years of age but it is not the most frequent cause of hospitalization. B: Coronary atherosclerosis is the primary cause of heart failure. A: Arterial hypertension is not the primary cause of heart failure. C: Myocardial dysfunction is not a cause of heart failure. D: Valvular dysfunction is not the primary cause of heart failure. C: Inadequate tissue perfusion is the dominant function as low oxygenation occurs because of this. A: Ascites may occur in cardiac failure but is not considered as a dominant function. B: Hepatomegaly is present in heart failure but not a dominant function. D: Nocturia is not present in heart failure. A: Stage I refer to a patient who reports no symptoms of heart failure at rest but becomes symptomatic with increased physical activity. B: Stage II refers to a patient who reports presence of symptoms with increased physical activities. C: Stage III refers to a patient who reports presence of symptoms with minimal physical activity. D: Stage IV refers to a patient who reports presence of symptoms even during at rest. B: An echocardiogram is usually performed to confirm the diagnosis of HF, and identify the underlying cause. A: Chest x-ray findings are also basis of the diagnosis of HF, but it is not the confirmatory diagnostic test. C: ECG is obtained to assist in the diagnosis. D: Ventriculogram is not a part of the diagnostic tests for HF.